If you are like most of my readers, you want to share God’s story with someone important to you. You are a parent who wants to share God’s story with your kids, or you are a youth pastor or teacher who wants to share God’s story with your students. We all share a similar story; we each have a desire to share God’s story with someone we love. Every story has a hero. The Matrix has Neo. Lord of the Rings has Frodo. Star Wars has Luke Skywalker. Your kids and your students have you. Every hero has a goal. As parents, our goal is to see our kids grow in wisdom, in stature, and in favor with God and man (Luke 2:52). As pastors and teachers, our goal is to see others look more like Jesus (Romans 8:29). We want to teach our kids and our students about God and His Word. We want to help them understand God’s Story and we want to help them understand their place in God’s Story. Simply put, we want to disciple others. Every hero has a struggle. The goal is easy enough – disciple our kids and students. So what’s the problem? Sometimes this is easier said than done. Sometimes they would rather watch TV or a movie. Sometimes they are more interested in entertainment than they are education. Sometimes they simply check out at a well-known Bible story. Sometimes they just want to watch their favorite movie or TV show for the 100th time. Every hero has a mentor. Neo has Morpheus. Frodo has Gandalf. Luke Skywalker has Obi-Wan. You have me. Let me help you share God’s Story with your kids! Let me be your Morpheus. Let me be your Gandalf. Let me be your Obi-Wan. Like Jesus often did, I will show you how to share God’s Word with movies. I will show you how to use entertainment as a vehicle for education. Like Paul also did, I will show you how to use our culture to share God’s story (Acts 17:16-34). Get my free e-book, How to See God’s Story in Movies. This free download will help you share God’s story with your kids and students by showing you how to see God’s story in movies. See the form at the bottom of this page. If you haven’t already, sign up for the Reel Parables email list. Not only will this guarantee that you get the latest Reel Parables posts, but I will also send to you my free e-book, How to See God’s Story in Movies. And be sure to stalk me on your favorite social media: Facebook, Twitter, Pinterest, Instagram, and YouTube. Be sure to check out my About page. This will give you a pretty good idea of what I do and what to expect from Reel Parables. While the content on my blog and podcast are free, I do have a few movie-based bible studies/devotionals for sale. One for Frozen and one for Finding Nemo. Wreck-it Ralph coming soon! So take a look at the Reel Parables store for resources that will educate and edify. Finally, please be sure to tell me and others what you think. Will you please share Reel Parables with anyone and everyone who you think will find it helpful? I would truly appreciate it. Also, drop me an email – or find me on social media – and let me know what movies you would like for us to talk about! My most popular posts/series are for Wreck-it Ralph, Frozen, and Lent. Hi, I’m Simon Smith. I help parents and teachers share God’s story with movies. I’m not a critic. I’m a teacher. I love God, I love movies, and I love when the two interact. When they do, I call them Reel Parables and then use them to share God’s story! I’ve used movies to share God’s story for years. First with my own kids, then at Church and AWANA, and now in our Boy Scout troop. I’ve even shared God’s story with movies while teaching in Cuba, India, Mexico, the Philippines, and Uganda. I now want to share God’s story with you and show you how you can share God’s story with your kids. Much like Jesus often did, I use stories, in my case movies (Reel Parables), to teach the Bible and to share God’s story. While others use specific scenes as teaching or sermon illustrations, I typically use the whole movie – the whole story – to teach God’s story. I typically post new content a few times a week. Also, I occasionally share content I think you may find interesting. 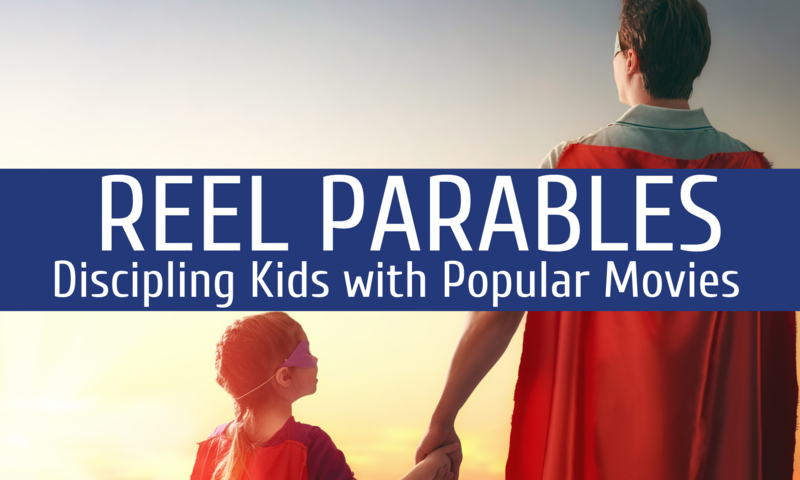 Reel Parables is more than just movie-based Bible studies, think of Reel Parables as a different kind of Christian movie review. You can find out more here. Educate and Encourage believers through God’s story. Engage the world with God’s story. Equip the Church to do the same. I don’t intend to give you moralistic movie reviews or recommendations. I use both Plugged In and Movieguide when I want that type of information. Instead, it is my sincerest prayer that Reel Parables will encourage you in your own personal story with Christ and equip you to share that story with others. I have a BA in Pastoral Theology from Southeastern Bible College (94) and an MBA from the University of Phoenix (05). I have worked for a Fortune 20 company since 1997, spending most of that time as a training developer and/or a corporate trainer. Before that, I worked at a local computer and software training company. As you can see, I love teaching. During this time in the corporate world, I have also been a part-time youth pastor, a part-time singles pastor, and an AWANA Cubbies director. My wife, Ericka, and I married in 1990 while still poor Bible college students and I wouldn’t go back and change a thing. During this adventure, we’ve had five kids, lost one to brain cancer, and still consider each other our best friend. We currently live in a suburb North of Dallas, Texas, where we have homeschooled all of our children. In my free time (What’s that? ), I enjoy movies (duh! ), concerts, reading, Scouts with my youngest son, binge-watching shows with my youngest daughter, and camping with my family. I am a member of Trinity Bible Church in Richardson, Texas, where I occasionally teach in my Sunday School class. I also teach the 7th and 8th-grade boys & girls in AWANA at Arapaho Road Baptist Church. You can easily find me on e-mail, Facebook, Twitter, Pinterest, and Instagram. This my personal blog. The opinions that I express here do not necessarily represent anyone or anything to which I am associated. The information I provide is on an as-is basis. I make no representations as to accuracy, completeness, currentness, suitability, or validity of any information on this blog and will not be liable for any errors, omissions, or delays in this information or any losses, injuries, or damages arising from its use.